The 2012 Jean-Michel Gerin, La Champine, IGP Colline Rhodaniennes is a bit of a steal for maturing Rhone Syrah. It comes across as drinking at its peak which means this gentle wine offers a bit of everything as soon as the cork is pulled. You might grab a bottle or two so you can shake up your mid-week rotation. Find it at MacArthur Beverages. Imported by Espirit du Vin. This wine is 100% Syrah aged 12 months in used oak barrels. Alcohol 12.5%. Hints of maturity and wood box with a subtle undertone of fat. Of moderate body, there are firm cherry flavors, a little earthy, and fine tannic structure. At the beginning of a gentle, mature state. **(*) Now – 2020. The pair of 2015 Domaine Jamet wines featured in this post are very different. Not just in terms of color but nature. 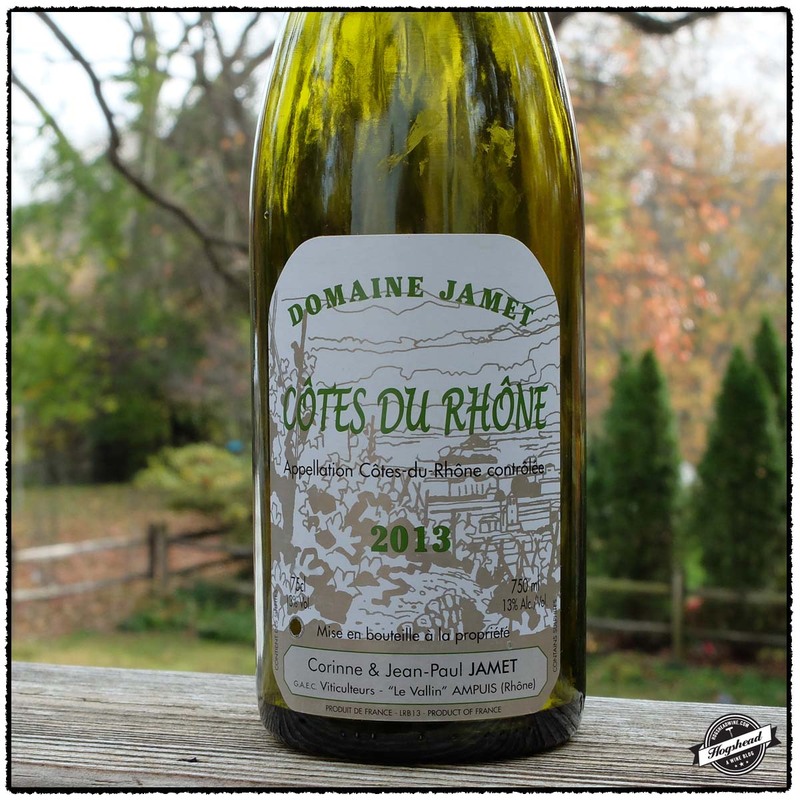 Over the course of three days, the 2015 Domaine Jamet, Cotes du Rhone Blanc remains very focused on only revealing its primary components which are flinty flavors of lemon and other white fruit. It is, in short, a wine with good future potential that you should just leave buried in your cellar. The 2015 Domaine Jamet, Syrah, Collines Rhodaniennes IGP is a wine to drink now. The rounded flavors and infusion of fat enable this to be a wine for drinking now. However, the generosity of the 2015 vintage does not take away from the Jamet subtlety. This subtlety of fruit coupled with graphite and fat place this wine unmistakably in the north. I recommend you drink this delicious wine as soon as you return with a bottle. These wines are available at MacArthur Beverages. Imported by Domaine Select. This wine is a blend of 55% Marianne, 30% Viognier, 10% Roussanne, 5% Grenache Blanc sourced from vines averaging 10 years of age. It was vinified in both stainless steel and oak barriques. Alcohol 13%. This is a pale straw color. There is a flinty, fruited started with a hint of wood by the middle. The wine is almost tart with lemon and white fruit flavors. With extended air it remains very focused, eventually taking on some fine texture through the aftertaste. ***(*) 2019 – 2029. Imported by Domaine Select. This wine is 100% Syrah sourced from 12 year old vines fermented in stainless steel then aged for one year in oak barrels. Alcohol 12%. The fat on the nose makes way to rounded flavors of minerals, graphite, and red fruit. There is also a subtle fat vein that works is way through the wine. The flavors become finely perfumed as the wine becomes dry towards the finish. For the near term. *** 2017-2020. The 2015 Domaine Georges Vernay, Syrah De Mirbaudie,Vin de Pays des Collines Rhodaniennes is a strong effort by Christine Vernay. What I like is that it is not overdone for this vintage, instead it is forward, and it retains a clear Northern Rhone personality. I would drink this over the next several years. Imported by Simon “N” Cellars. This wine is 100% Syrah sourced from 20 year old vines located adjacent to Condrieu. Alcohol 12.8%. This floral, light black fruit flavors are supported by minerals underneath. There is a controlled vein of fat and some fine tannins with grip. With air a ripe, orange citrus note comes out in the finish. *** Now – 2022. Xavier Gerard is a young winemaker in the Northern Rhone that has produced wine for roughly one decade. He has holdings in Condrieu, Cote Rotie, and Saint-Joseph from which he makes five different wines. I tasted the 2014 Xavier Gerard, Viognier, IGP Collines Rhodaniennes which is essentially declassified Condrieu. Upon first pour, the wine is and remained very aromatic. In the mouth are waxy, nutty flavors of tropical white fruit. My first impression is that this saw some skin-contact but after being open for one week (!) the wine reveals itself as full-bore. Perhaps a little polarizing, this wine no doubt delivers a substantial amount of aroma and flavor for the price. Check it out! This wine is available at MacArthur Beverages. Imported by Neal Rosenthal. This wine is 100% Viognier fermented primarily in stainless steel vats with a minority in oak casks. Alcohol 13.5%. Those nose is very aromatic and attractive. In the mouth are waxy, nutty, tropical white fruit flavors. At first the wine tastes a little robust and tannic as if it saw skin contact. With air it shows complex white floral flavors, supportive acidity, and a tropical punch flavor in the aftertaste. *** Now – 2021. The Jamet family are masters of Syrah in the Northern Rhone. Tasting the Cote-Rotie at Robert Kacher’s Annual Portfolio Tasting is always a treat. I am also fortunate in that I have friends who have shared older bottlings and the experience is always singular. Fortunately, the portfolio extends beyond Cote-Rotie to present affordable selections for current drinking. 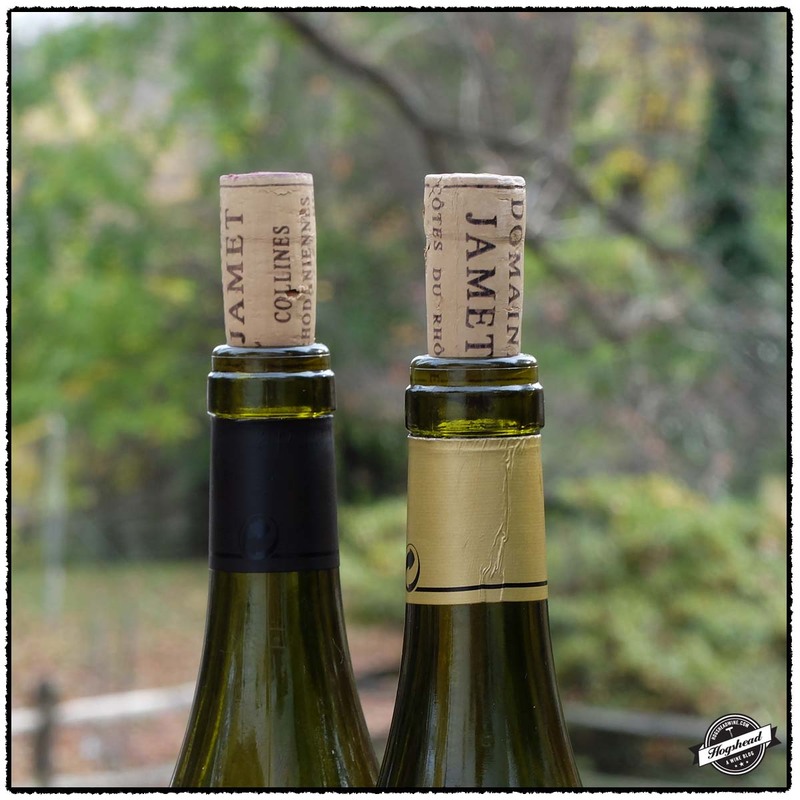 The 2013 Domaine Jamet, Cotes du Rhone Blanc is less fruit-driven than the two previous vintages. Instead, it offers an infusion of pickled ginger and rosemary both in aroma and flavor. It may sound crazy but it works and again, presents a singular experience. The origins of the 2013 GAEC Jamet, Syrah, Collines Rhodaniennes is unmistakably Northern Rhone. This wine needs a few hours of air and is best consumed on the first night. It is a good wine but not quite up to the level of the 2012 vintage. It is, though, a pure wine which you can turn to when you want youthful expression of Syrah. These wines are available at MacArthur Beverages. Imported by Robert Kacher. This wine is a blend of 55% Marsanne, 30% Viognier, 10% Roussanne, and 5% Grenache Blanc that was aged for 12 months in stainless steel tanks and barriques. Alcohol 13%. The beautiful nose is evocative of pickled ginger and fresh rosemary. In the mouth, the wine is first surrounded by some fat then as the rosemary and other fresh herbs come out, the acidity becomes present on the sides of the tongue. This distinct wine finished up with some grip and textured tannins on the gums. *** Now – 2017. Imported by Robert Kacher. This wine is 100% Syrah sourced from vines averaging 12 years of age on soils of schist and granite. The fruit was completely destemmed, fermented in stainless steel then aged for 12 months in oak barrels. Alcohol 12.5%. This is clearly a Northern Rhone Syrah with lovely red fruit that tastes as if from young vines. The wine sports ample strawberry ripeness, red grapefruit, and some fat. Unmistakable in origin. **(*) 2016 – 2018.